Welcome to the three hundred and sixteenth of my blog interviews with novelists, poets, short story authors, biographers, agents, publishers and more. Today’s is with fantasy novelist Ken Magee. A list of interviewees (blogged and scheduled) can be found here. If you like what you read, please do go and investigate further. Morgen: Hello, Ken. Please tell us something about yourself, where you’re based, and how you came to be a writer. Ken: Hello. My name is Ken Magee and I’m an… author. Ken: I live in the North of Ireland and I’m delighted to have the chance to say a few words about my background. I worked for many years in the computer industry in a wide variety of roles including programming, systems analysis and sales. In the middle of it all, I served in the Navy Reserve for five years… which was hard work, but fun. In 2010, I semi-retired and decided it was time to finish the book I had started about 30 years ago (writing not reading). I would have finished it sooner, but life got in the way. It’s finished now, but I don’t think any of the original book survived the process! I am married with two grown up children, five grand children and two dogs. I love reading, writing and words. I have a keen interest in music, technology, movies, travel and the Internet. To keep fit I play badminton when I get the time … and I walk the dogs even when I don’t get the time. Morgen: It’s funny how we always find something of a higher priority – even the top authors say they do everything else they can and I’m the same (although it’s usually the day job, blogging or emails that get my attention) and yet writing is so wonderful – there really is nothing like it. What genre do you generally write? Ken: I generally write fantasy novels. Well, maybe ‘always’ is more accurate. I’ve now written two novels and they’re both humorous, contemporary fantasies. Morgen: Ooh, have these been published? 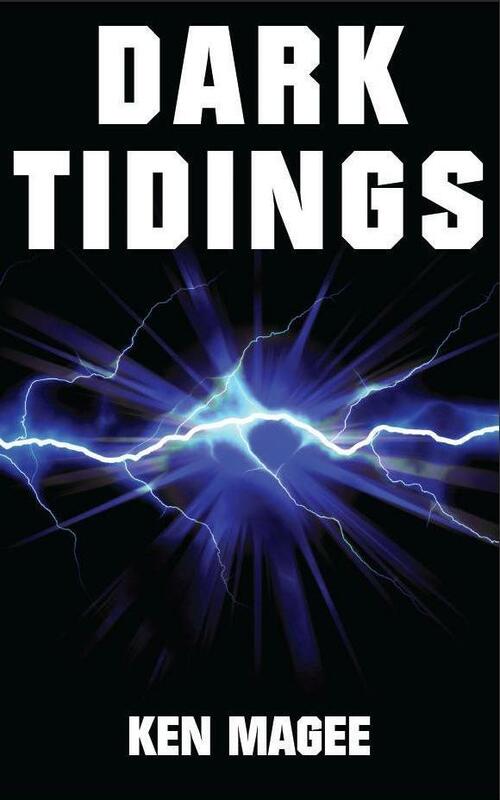 Ken: It has; Dark Tidings was published in November 2011 and it’s available from lots of online outlets including Amazon: Dark Tidings (Kindle US), Dark Tidings (paperback US), Dark Tidings (Kindle UK), Dark Tidings (paperback UK). The sequel, The Black Conspiracy, can be found on Amazon.com and Amazon.co.uk. Morgen: How exciting. I have four and a bit novels to edit so will put those out myself, after my first readers have been through them, of course. Have you had any rejections? Ken: I sent the Dark Tiding’s manuscript to a few agents and publishers, but I didn’t get too downhearted because I was lucky to get accepted, quite quickly, by a small UK publisher. They helped me a lot with beating the book into its final shape and they made me feel that I was doing something worthwhile. I did, of course, get a number of rejections, but I was expecting that so I didn’t worry too much. Having said that, it was always disappointing to get a pro forma, non-personal ‘NO’ letter. Ken: Yes. We produced a Kindle version of Dark Tidings and it’s selling well. Personally, I enjoy eBooks, but there is nothing like the real thing! Morgen: Almost every author I’ve spoken to has said that. I love my Kindle as it’s so portable and you can’t break the spine of an eBook. 🙂 How much of the marketing do you do? Ken: I must say I have found the marketing very hard. I am new to writing books, never mind promoting them. I have tried to build an on line presence on Twitter (@Ken MageeAuthor) and with a Dark Tiding’s Facebook page, but it is very hard to get noticed. Blogs are very important too, so getting this interview opportunity here is precious to me. Morgen: Ah, thank you. I’m delighted you feel like that and I’m so grateful for you as everyone who says “yes” gives me something to talk about. 🙂 If your book was made into a film, who would you have as the leading actor/s? Ken: I got a really nice review in a multimedia Showbiz and Entertainment magazine called euVue. The review ended with the words “Dark Tidings begs to be made into a film. Harvey Weinstein on fast dial please!”… so maybe a movie is on the cards! If it happened, I’d love unknown actors to be given the lead roles, because everyone who’s new needs a break (like me :)). Either way, I still want to go to Hollywood and schmooze with the A-listers. Morgen: Wouldn’t that be great. Fantasy is hugely popular so fingers crossed. You’re with a “small publisher” (Ragged Cover Publishing), did you have any say in the title / covers of your book? How important do you think they are? You ask how important they are… I ran a poll on a reader’s forum and cover design came 9th out of the 10 listed ‘reasons to buy a book’… title came 8th. Not scientific, but interesting nonetheless. Morgen: Very. I would have thought they’d be higher and the cover above the title, although I’m a big title fan. What are you working on at the moment? Ken: I am writing the follow-on to Dark Tidings. I felt the book ended at a clean, but interesting, point. I’m hoping there are lots of readers who’ll want to know what else could possibly happen to the main characters… and I hope they care what happens to them. Morgen: If people enjoy a book they do usually want to go and read something else (so I’m hoping to get at least two of my books out at the same time). Do you manage to write every day? Do you ever suffer from writer’s block? Ken: I do write every day, but only because I enjoy it. I try to fit in marketing activities too, but that’s where I struggle a bit. I do suffer from writer’s block and he’s called Rocky. My collie seems to sense when I’m on a writing roll and that’s when he decides to demand some attention. It really doesn’t help. Morgen: Oh dear. Mine just sits in the chair next to me (facing me) and gives me the big-brown-eyes look. Do you plot your stories or do you just get an idea and run with it? Ken: A bit of both really. I have the basic plot in my head, but I have no idea how the characters will navigate through the various twists and turns. And in Dark Tidings, there were a few shocks which came right out of the blue… even I wasn’t expecting them. Also, the humour definitely comes during the writing and again, I was surprised by a lot of it… I often found myself laughing out loud as I wrote. Morgen: I love that you weren’t expecting the shocks because that means your readers won’t either. I clap when I’ve written something I like – then my dog thinks I’ve gone mad… although he’s pretty used to it now. Do you do a lot of editing or do you find that as time goes on your writing is more fully-formed? Ken: My writing is definitely more fully-formed now, I think my ‘voice’ has matured a lot compared with when I started. There still needs to be a lot of editing to ensure correct grammar, punctuation and syntax. The editing process also tightens the writing and makes it more reader-friendly. While I can get close to a completed manuscript, I think it is vital to use a professional proofer for the final version. It is all too easy to read what you meant to write rather than what you actually wrote and the professional will also remove ambiguities and the like. Morgen: A writer absolutely needs an editor. Mine not only picks up (thankfully not too many) errors but also comes up with some great suggestions. What advice would you give aspiring writers? Ken: Stick at it. My book took 30 years to finish, but I got there. There is no better feeling than having a printed copy of your book in your hand for the first time. Morgen: Wow. I interviewed Sheila Quigley last November and it took 30 years for her novel to be published but she’s doing really well now, so absolutely, don’t give up. 🙂 Are there any writing-related websites and/or books that you find useful? Ken: I love Goodreads. It’s the perfect site for book lovers and a super place to ‘meet’ other readers and writers. Similar, but with an emphasis on the Kindle, are http://www.kuforum.co.uk (focusing on UK readers) and http://www.kindleboards.com (focusing on US readers). Morgen: 🙂 Goodreads is the only place I received a 1* rating and the vow never to read my writing again – I thought it was hilarious. I’ve not explored the site properly yet but do get friend requests quite often which is lovely. Is there anything else you’d like to mention? Ken: I’d just like to thank you again for this opportunity to talk to your readers. It means an awful lot to a new author to get a platform like this. Morgen: Oh, you’re so welcome. Do come back and do something else… especially when novel 2 comes out. 🙂 Is there anything you’d like to ask me? Ken: How on earth do you get the time? Your time management must be superb! Morgen: 🙂 I’ve been a secretary since I left school and have been working out since then what I wanted to do, then light bulb moment when I went to creative writing evening classes seven years ago and now all that organising and typing practice is definitely paying off. 🙂 Thank you, Ken. I am so pleased to hear Ken say that the original work was lost in growth of the new book! I am finding my writing, editing and proffing taking me places I did not intend to go, and am very easily getting lost in my own words. I would love to take you up on the offer sometime of the 1000 words flash fiction, but need to get a bit more experience first! Glad I subscribed . Thanks Morgen for this blog.